Valentines day is right around the corner. To commemorate the favorite holiday of yours truly, I’ve elected to review not only a comic with a romantic theme, but also a comic from one of my all time favorite series: Secret Six. We talked briefly about Scandal Savage last time around, but we didn’t really cover her in depth. 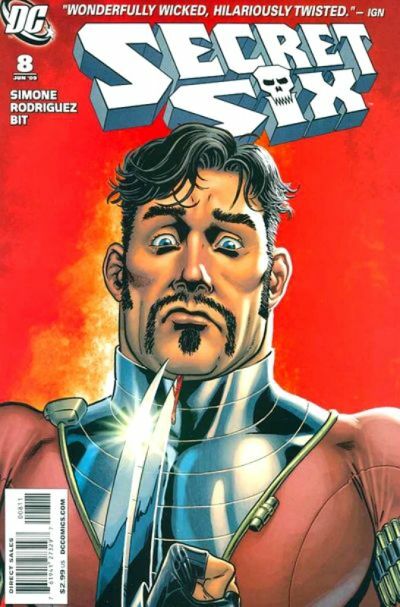 Scandal, a creation of Secret Six writer Gail Simone, is the daughter of well-known immortal DC Comics super villain Vandal Savage. Despite inheriting his ruthlessness as well as a degree of his immortality, Scandal despises her father. The thing Vandal wishes the most from his daughter is that she bare him an heir. The only problem with this, Scandal prefers the company of women, irritating her father to no end. In events leading up to this comic, Scandal’s longtime lover, Knockout, was murdered, destroying Scandal. However, after having secured a means to ensure that her lover’s soul will be at peace and not tortured in hell, Scandal was able to herself make peace and move on, but she may soon find that this will not prove as easy as she thinks, because people like her, bad people, don’t deserve happiness… do they? We open with Scandal going grocery shopping. Before we go any further, I just want to say how much I love that concept, simple though it may seem. Despite being the protagonists of our story, the secret six are still villains at the end of the day. Can you imagine someone like The Joker or Deathstroke doing something as mundane as going grocery shopping or getting their car serviced? We’ll elaborate more on this later, but I do appreciate the effort Gail Simone makes to humanize these characters. Anyways, while Shopping, a red-haired woman runs up to Scandal, picks her up and kisses her on the lips. Scandal, having no clue as to the identity of this mysterious girl and likely to shocked to stab her as she would normally with an unknown assailant simply stands there with a surprised and stupid expression on her face. The woman, clearly not sensing the awkwardness of her behavior, continues talking to Scandal like nothing is wrong until she realizes that the woman she just kissed in the middle of a crowded store doesn’t actually recognize her. So, embarrassed, the woman, whose name is Liana, explains who she is. You see, shortly after Knockout’s death, Scandal had retreated into a deep, alcohol filled depression. In a well meaning, yet extraordinarily ill-advised, attempt to cheer her up, the other members of the Secret Six hired a stripper who resembles Scandal’s deceased lover, had her dress up as said lover and pop out of a cake on her birthday. Needless to say, the typically short-tempered and incredibly inebriated Scandal Savage did not take this thoughtful gesture as intended. Speaking of the other members of the secret six, we find Floyd Lawton, aka. Deadshot, also in a predicament involving matters of the heart. Jeanette, the newest addition to the team, has asked him out on a date, and seeing as how Jeanette is a centuries old Banshee who could probably extinguish his soul with a thought, he’d feel a little more comfortable if he had a wingman. However, in the previous arc, Deadshot, albeit temporarily happened to betray the entire team, and although they let him back into the group, their not exactly inclined to do him any favors. The only team member willing to give Lawton a hand is Ragdoll but having Ragdoll be your wingman is a lot like hiring a kitten to be your chauffeur: It may be adorable and perhaps a bit funny at first, but it inevitably ends in disaster. Back at the grocery store, Scandal appears to have gotten over the initial shock of realizing that she was just accosted by a stripper she was too drunk to remember who just so happens to look exactly like her dead lover and the two are now politely conversing. Liana, already aware of the fact that Scandal is still grieving and having also deduced that her guilt is holding her back from living her life, suggests that they should get together for a date sometime, believing it will be good for her. Scandal politely declines her offer but takes Lianas number just in case she changes her mind. Back at the House of Secrets, the headquarters of the Secret Six, Deadshot is getting ready for his date, his pears rolling their eyes at the fact that Lawton’s fashion sense closely resembles something that could only have been brought into existence by every tacky article of clothing from the disco era combining their powers to unleash some sort of Captain Planet of hideous sport jackets. Scandal, likely out of pity, agrees to Deadshot’s wingman, or wingwoman as it were, but only if he agrees that there is to be no killing while on their date. After borrowing a suit from Catman that doesn’t make Colin Baker’s Sixth Doctor costume look like appropriate garb for polite society, Deadshot, along with Jeanette, Scandal and Liana, sets out on the date. Liana, hearing the other three discuss Scandal’s “no killing” rule thinks that they’re pulling her leg. Scandal, not wishing to expose an innocent like Liana to her life style, hopes it remains that way. Unfortunately for our group, some skinheads whom Deadshot had beaten the living hell out of in a previous issue spot them and plan to do a little date crashing. First stop in the evening’s festivities, what I can only describe as a nightclub in which the clientele and staff is comprised entirely of cosplayers where Liana’s cousin’s band happens to be playing. While Scandal and Liana are having fun, Deadshot can’t dance so instead finds the bathroom where one of the skinheads is waiting to ambush him. A man of his word, Deadshot doesn’t kill his attacker, but that doesn’t stop him from beating the skinhead senseless with a lead pipe and giving him a swirly. While all that’s going on, some creep who likely learned all his dating skills from Futurama’s Zapp Brannigan begins hitting on Liana, right in front of Scandal no less. Scandal, not one to suffer idiots like this guy, promptly clocks him in the face. After the concert, Liana is grateful that Scandal was willing to fight for her honor, much to Scandal’s own surprise. Over dinner, the three members of the secret six are engaged in a very interesting philosophical debate regarding the nature of morality. As Deadshot and Jeanette argue that in the grand scheme of things, our actions do not matter and that people are naturally vengeful, scandal, Liana chimes into the conversation and expresses her belief that people are inherently good and sometimes are unable to tell the difference between sadness and anger, causing them to lash out at people who care about them, something that makes her sad. While Scandal and the others have seen too much throughout their lives as criminals and killers to be able to view the world through Liana’s naïve and innocent eyes, Scandal does appreciate the sentiment and, for the first time since Knockout died, finds herself truly able to smile. However, this happy moment is interrupted as the skinheads crash the party. While Deadshot gets cornered, Jeanette tosses one of them out the window and kills each one of them with ease, justifying it by saying that she never agreed to scandal’s conditions. While Jeanette and Lawton are both turned on by their mutual love of violence, Liana is shocked and horrified by the several murders that were just committed before her very eyes. Scandal finally takes this opportunity to share what she’s really feeling with Liana. Knockout was her soul mate, the true love of her life. Knowing that she’s done so many bad things in her life, she simply cannot bring herself to believe that she will get another chance like that. Liana on the other hand is an innocent and a decent, compassionate human being. Scandal could never expose someone like this to her world. Someone like her, doesn’t deserve someone like Liana. The bad guys, like her, don’t deserve a happy ending. Liana hears all of this, and doesn’t care. In accordance with her philosophy, she believes that all people are good, and she wants to help Scandal get over her sadness. Liana may not know if Scandal deserves her or not, but she’s more than willing to find out, and thanks to her, so is Scandal. And so, despite some minor hiccups, date night was a success, and both couples go home happy. Something I’d particularly like to address is the approach taken to writing the characters in this series, specifically, how human they are. To contrast, while Superman has grown over time into a complicated and nuanced character, he is still more predominately written as an archetypical hero. Now take the Joker. Sure the Joker is a fun and effective character, but he’s always written as an archetypical psychotic villain. The secret six on the other hand, are almost never written as archetypes, they are written like actual people. Not especially good people, not necessarily bad people, just people. They do bad things, they’ve done good things. They deal with romance and they deal with heartbreak and everything in between. Even something as small as Scandal at the grocery seems indicative of this mentality. When was the last time you saw The Joker ordering a pizza or Superman watching a football game. Little touches like that make these characters more relatable and as a result, more interesting to read about. I do like the way Scandal and Liana’s relationship builds. Scandal clearly wants to be with Liana, but you can tell that her grief and her insecurities are holding her back. However, over time, Liana’s personality begins to break through her barriers and she starts to open up. Initially, I was going to comment on Liana’s initial greeting of scandal, having at first written it off as unrealistic. However, after discussing it with some friends, I discovered that this may simply be a part of her personality as an extrovert who is very comfortable with public affection. It was obvious that she expected Scandal to recognize her and as soon as she figured out that this wasn’t the case she recoiled in embarrassment, so what I initially wrote off as unrealistic instead becomes a likeable quirk of the character. Beyond that, my only real complaint is the absence of Bane, another recent addition to the team, from this issue, but as his presence wasn’t really needed, that’s merely a minor nitpick. While this is not an action or plot heavy story, it is still one of the strongest examples of what makes secret six as great as it is. It is for this reason that I have such high hopes for the new series, because I have this level of quality to compare it too. Happy Valentines Day everyone. Until next time.